Since our inception well over a year ago, HarlemCondoLife (HCL) has been introduced to several interesting people living and working in Harlem-particularly local artists who have a positive link to Harlem. HCL would like to introduce some of these individuals to you, along with their work, in hope that you will be moved and amazed by the wealth of talent that lives right here in our Harlem community. We certainly are impressed and excited to have you meet some of these talented individuals on our blog site. To help us kick off our first HCL Artist Profile, first up is a local watercolorist. 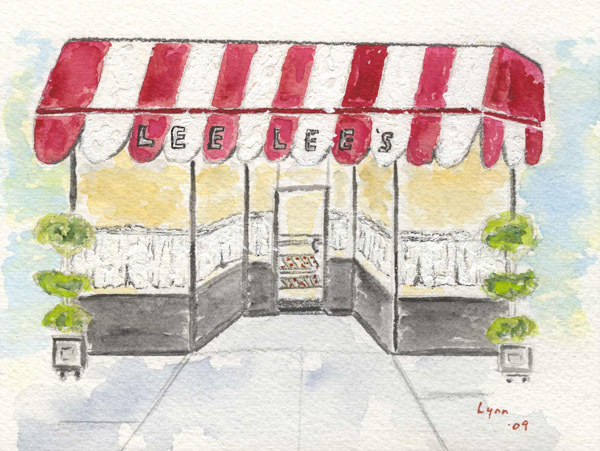 In a Q&A (questions and answers) format, meet Lynn Lieberman in her own words on Harlem in watercolor. What is your area of specialty? And why do you feature Harlem in your art work? My primary area is watercolor. I live, work and create right here in Harlem. 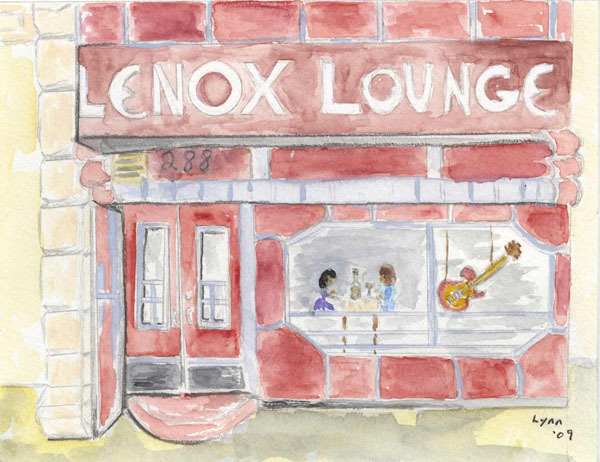 Most of my work is small format-note cards of everything from the famous Lenox Lounge to Apollo Theater to Lee Lee’s Bakery, where Mr. Lee displays my painting of his bakery. 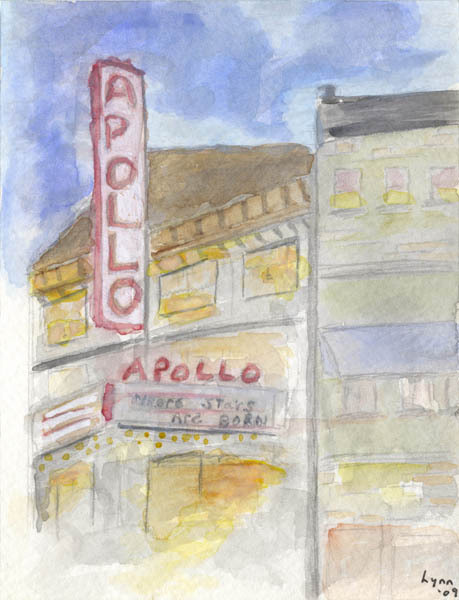 In an effort to capture more of Harlem, last year I created a watercolor map of Harlem, which was updated this year and can be viewed on my website. As for why Harlem, we have street after street of graceful prewar buildings, each with their own unmistakable curves and lines. Many have been home to the people who reside there for decades, and signs of love and longevity protrude from window boxes, along with flower pots and signs in the windows. Does Harlem move and inspire your art work? Inspiration here in Harlem is endless for a watercolorist. 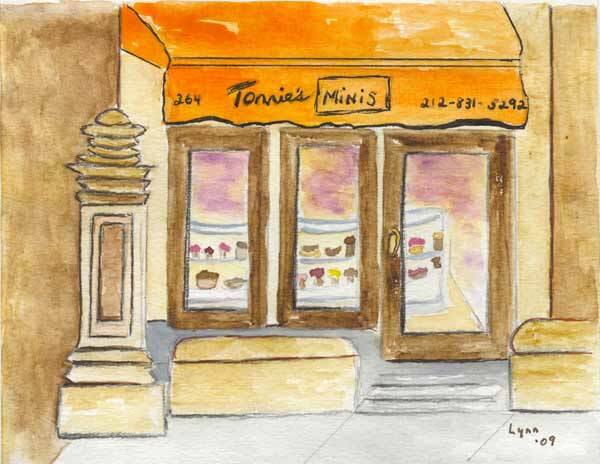 No matter how many times I walk the streets of Harlem, I always see something different and new to paint, from the Harlem Meer in the Fall to Fields Court at Christmas to the colorful Minton’s Jazz Club, Mike’s Newsstand on 122nd Street and Lenox Avenue, and to Tonnie’s Minis, where they also display my note card painting of the place. Is it challenging to use Harlem in your work? 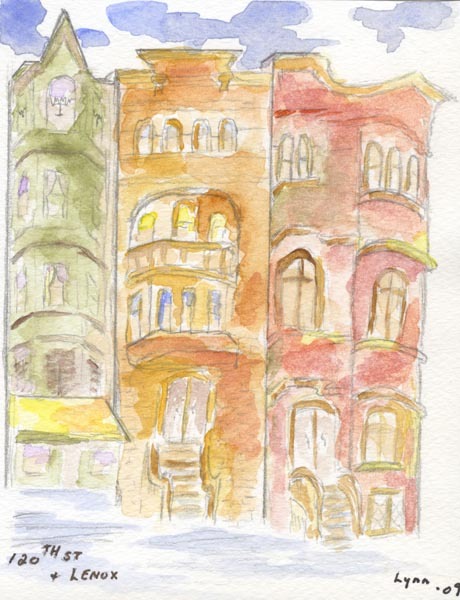 The only challenge to painting Harlem is what to leave out. 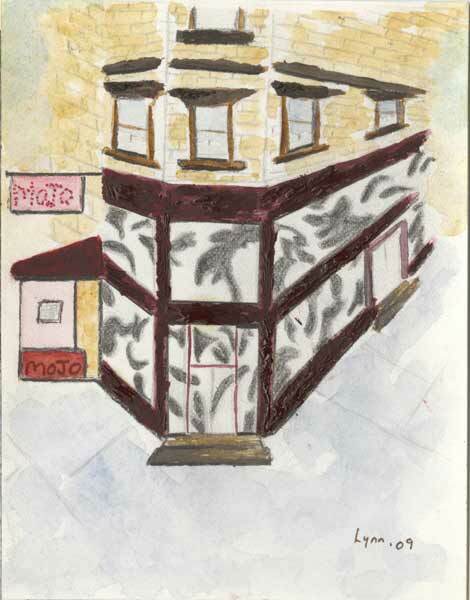 Aside from watercoloring Harlem, HCL has to ask what are some of your favorite things about it? Harlem Seasons. At the first sign of Spring and all through the Summer, window sills are abound with color right up until Halloween pumpkins and Christmas trees with lights. No Holiday is forgotten here. Harlem people. Where else in this City can you find people sitting on the sidewalk in their beach chairs enjoying a beautiful Summer evening or barbecuing in front of their building? Harlem has a plethora of green space from our major Parks to our local Green Thumb gardens-giving us easy access to hours of walking or bike riding from the minute we walk out our front door. Our diversity is great. I was born here in the City and have lived in a variety of places over the years, always returning home. Harlem is a place where I feel most comfortable and the place where I live with my family. And Harlem has s vibrant art community with plenty of ongoing events at the Studio Museum of Harlem, the Harlem Arts Alliance and Casa Frela Gallery, which represents my work. And if you know of a local artist we should spotlight on HCL, who resides in Harlem and their work is linked to all things positive about Harlem, please send your recommendations to feedback@harlemcondolife.com. 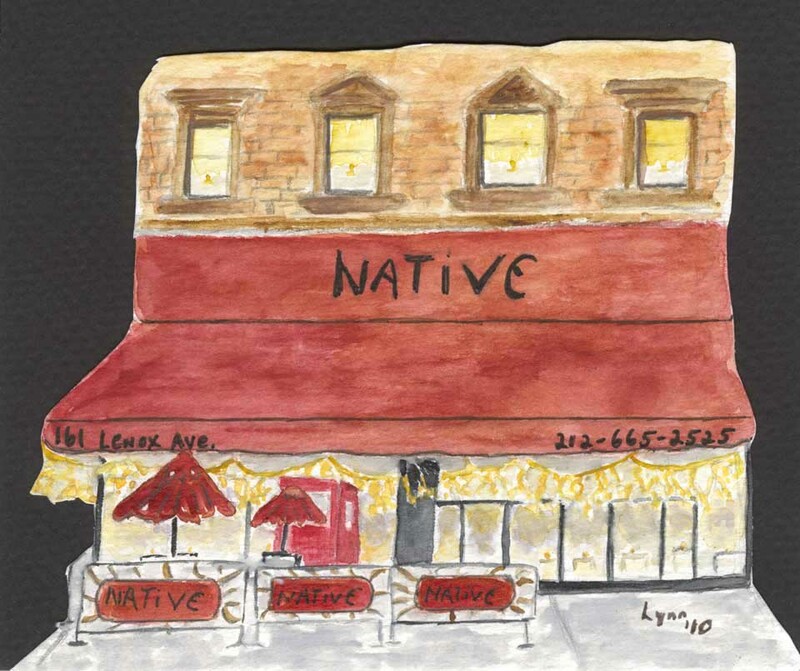 We would like to give a special shout out and congrats to Lynn, a local Harlem watercolorist. Her note cards & Harlem Map are now being sold at The Studio Museum in Harlem! Way to go Lynn! and child alike. She captures the charm and simple warmth of many of these buildings. Can’t wait to visit all the places that Lynn has painted in watercolor. Love her unique work. Love them all! Keep painting, can’t wait to visit again. I want Cake! I love Lynn’s watercolors and her whimsical style. I look forward to her paintings and hope one day to be able to visit Harlem and see the iconic buildings she has brought to life in her work. Lynn brings Harlem to life through her art. Especially important to those of us who do not live in the city. Lynn makes you want to go there and immerse yourself in all that Harlem has to offer. I love her work. These watercolors follow a long tradition of marking iconic landmarks and everyday places in the rich tradition of Harlem. For me, Lynn’s colors & form are a celebration and offer easy access to the joys of living in Harlem. This watercolor work is amazing! It is refreshing to see an artist embracing the beauty of Harlem and NYC in this medium. Her work is significant as it embraces the new Harlem for example Il Café Latte, Tonies Minis along with the old Harlem being Sylvia’s, Lenox Lounge etc as a single unique neighborhood of beauty. The new Harlem is slowly coming into focus through this artists work.